The Goldfinch and Washington Street intersection in Mission Hills packs a lot into just a few short blocks. 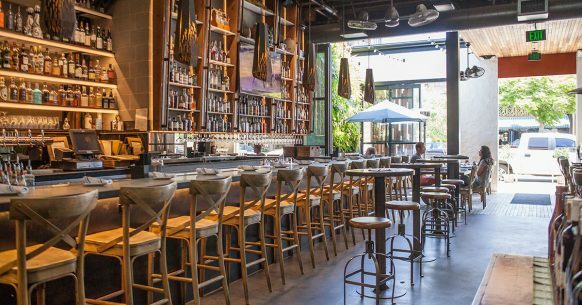 Here you’ll find a bevy of farm-to-table and neighborhood restaurants, along with shopping and entertainment, set in a fashionable urban community. From the owners of the original Patio in Pacific Beach, this modern indoor-outdoor space festooned with rain forest plant walls brought to life a restaurant scene in this neighborhood that, a few years ago, needed it. Thanks to their ahi poke tacos, braised lamb shank, craft cocktails, and other delights, the Patio started a very good thing in this corner of Mission Hills. From brunch and coffee to dinner and late-night cocktails, this farm-to-table eatery serves seasonal, organic food alongside craft beer and wines. Though big-city minded, Brooklyn Girl is approachable, affordable, and very San Diego. Pastries, pasta, pizza—an Old World theme runs throughout, though oyster sliders, fish tacos, and bacon-wrapped Vietnamese meatballs mix things up. Catch a classic or contemporary movie on the big screen at this intimate outdoor movie theater. Also available to rent for private parties, the theater offers heaters and blankets to keep you warm on chilly evenings. Don’t miss the classic cartoon screening that kicks off the headliner. The name is a reference to a 1948 tune most famously sung by Nate King Cole. The food is an homage to global cuisines, with an addition or two that may expand your horizons—and possibly your vocabulary. The lamb sausage is served with schug (a Yemeni hot sauce made from chiles), for example. Other dishes rely on familiar ingredients in simple styles: roasted white fish is served with butter herbed oil; the pumpkin and Danish blue flatbread comes with prosciutto. Just around the corner from Goldfinch Street lies this rustic, farm-to-table eatery serving everything from blue crab Eggs Benedict to pork belly with risotto dinner entrees to sorbet for dessert. Last year, Milanese chef Luciano Cibelli bought this restaurant from the former owner, Trish Watlington, who’s credited with jumpstarting the farm-to-table movement in San Diego nearly a decade ago. In an atmosphere that’s more like a friend’s dining room than a restaurant, The Red Door sources nearly all its ingredients from local farmers. Today, Cibelli carries on the restaurant’s legacy by hand-selecting every Brussels sprout, eggplant, scallop, and gelato. This charming gift boutique housed in a cottage offers a slice of southern France in San Diego. From cookbooks to soaps to food items, this is the spot for last-minute gift shopping and anyone looking for that authentic French vibe. This entry was posted in Neighborhoods and tagged entertainment, Hillcrest by San Diego Magazine. Bookmark the permalink.